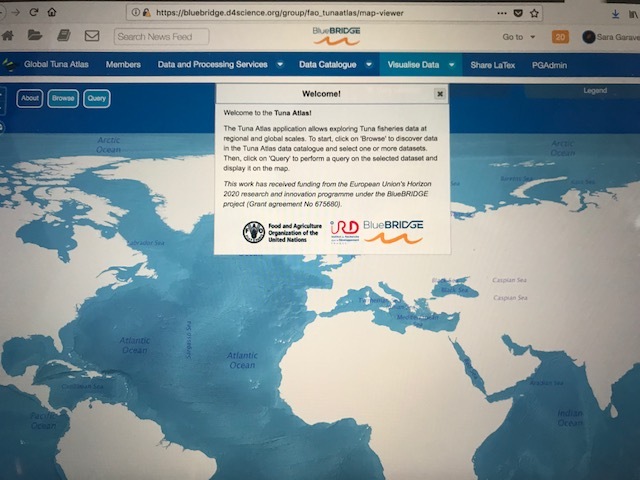 Tuna Atlas provides services to discover the available datasets at regional and global levels, extract them in several formats widely used by the scientific community (e.g. CSV, NetCDF, SDMX) and visualize them in an interactive web-viewer of indicators and maps. It also includes tools for the users to generate their own Tuna atlas by applying own processing (e.g. applying specific choices for scientific corrections) on the tuna RFMOs data. Who is Tuna Atlas for? The Tuna Atlas VRE enables to access data discovery, storing, sharing, access, process, visualization services through a single environment. This environment is collaborative: anyone can enrich it with new data and processes, making them available to the whole community. The services proposed by the VRE can be used outside of its context: they can easily be integrated within other websites. As an example, the interactive web-viewer of indicators and maps can be ported within partners websites. The VRE offers powerful on-line computing resources and unloads users from recurrent issues when sharing data or codes and working locally - like software version issues. 3. There you go: start using the TUNA ATLAS VRE. Any questions on the features of the Tuna Atlas VRE? On 18 January 2018, 3:00pm CET the VRE was introduced in the webinar "Managing tuna fisheries data at a global scale: the Tuna Atlas VRE"